How I became an Islander. Editor’s note: Dr. Charlene Kozy has been contributing articles to Times of the Islands for nearly a decade. They range from a survey of the various flags and emblems used by the country, to detailed histories of the life and times of the Caicos Islands’ Loyalist plantation owners, to fond recollections of her association with the women of Middle Caicos, and a tale of pirates and one of Caicos Cay’s original homeowners, Countess Helen Czernin. In the following memoir, Dr. Kozy reveals just how she became associated with the Turks & Caicos Islands 40 years ago and how it became an important part of her career. It makes me honor and appreciate her contributions all the more. We look forward to more to come. While teaching in a Nashville high school in the late 1970s, I agreed to teach a new course. In so doing I suddenly became Tennessee’s first high school teacher of anthropology, the study of human societies and cultures and their development. This led to participation in some homegrown archaeology, a specialty within anthropology. Centuries-old stone box graves pertaining to the Native American Mississippian culture were discovered practically next door to the school during construction of a golf course. The find attracted the attention of Dr. William Bass from the University of Tennessee. Among many other things he taught my class how to determine the age and gender of a skeleton. Under his direction, my class reconstructed the stone box grave of a teenage boy just about the age of my students. Subsequently, it went to the State Museum. This experience ignited my desire to do something more challenging than just teaching. I combed through a pile of journals and advertisements for research volunteers and found a grant from Earthwatch, a non-profit international organization that provides human and financial support to scientific research projects. If accepted, the grant would fund me to go to the Caicos Islands with a group from the University of Illinois. When I was accepted in 1977, I jumped at the opportunity without knowing exactly where I was going, what kind of work I would be doing, or whom I would be working for. I found myself spending six weeks with archaeologist Shaun Sullivan’s group studying the Lucayan Taino Indians and tediously unearthing their ancient artifacts. Dr. Sullivan was an excellent teacher on the ways of archaeology—but also an ex-Army Green Beret and hard taskmaster! In 1977, Constance and Emmanuel Hall opened their home and shop in Middle Caicos to the Earthwatch expedition. 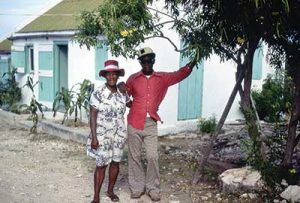 We lived in the settlement of Bambarra on Middle Caicos and our meager “leisure time” was spent at Emmanuel Hall’s store. I listened wistfully with him and his wife Constance to a clear channel radio station from my hometown of Nashville, 1,400 miles away. I also learned to play dominoes on Saturday nights with Mr. Hall’s customers. Mrs. Constance was always there finding things for the villagers, and being sure all were taken care of. I felt at home in the country store, in so many ways like my dad’s—the one I grew up in. I learned about the culture of the people of Bambarra, and all the things we had in common. When the Earthwatch expedition was over, I returned home and put my degrees in History to work, immersing myself in library research. I learned the ruins were the remains of plantations belonging to British subjects who were forced to leave their holdings in Georgia and Florida following the U.S. War of Independence. The British Government offered them large land grants in the Bahamas and Turks & Caicos Islands as compensation for their losses in the newly created United States and in recognition of their loyalty to the Crown. They became known as the American Loyalists. American historians wrote little about American Loyalists in textbooks. I could find an unflattering paragraph about them here and there that always included how they were tarred and feathered by “The Sons of Liberty,” trying to make revolutionaries of them. Knowing that there was little interest in this group, I took my findings and thoughts to my former history teachers at Middle Tennessee State University (MTSU). One kind professor, Dr. Fred Rolater, encouraged me to consider it a worthwhile study for a doctorate. He continued to be a mountain of support through my arduous road to becoming Dr. Charlene Kozy. But my quest was just beginning. I was accepted as a doctoral student at MTSU. I married Steve Kozy, a very patient and understanding man, who traveled with me to Nassau to read microfilm in their archives and to the University of Florida looking for knowledge of the Loyalists. Then we found a company in Orlando, Florida that was microfilming Nassau’s records. I purchased copies to read under less stressful circumstances. These films were records of land grants to exiled individual Loyalists and even gave their locations in the Caicos Islands. Soon, I was no longer satisfied just to read about the Loyalists. Now, armed with my research, I wanted to return to the Turks & Caicos to see if I could find the places where the people I had been studying actually lived! But where to start? While staying at the Island Princess, one of the three hotels on Providenciales in those days, Steve and I met Tommy Coleman. Upon hearing my story, he suggested a trip to Parrot Cay to meet a woman who lived on a restored Loyalist plantation. Excitedly, we accepted the invitation and met Countess Helen Czernin who graciously invited us to stay in modernized slave quarters converted to guesthouses. This friendship endured for many years. 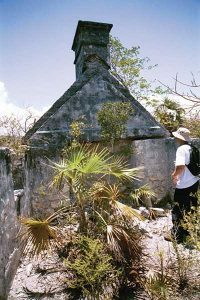 Helen moved to Grand Turk and introduced me to influential people such as Mrs. Grethe Seim and government officials who encouraged me and gave permission to study the ruins on Middle Caicos and even bring in field school students. I was no stranger on Middle Caicos, especially to the people of Bambarra. I needed their help, and they gave it freely. Their acceptance of my husband and me was unusually good. At first, we stayed in the “Government House,” which also served as a clinic, but after a few visits we were invited to stay with Islanders in their homes. There were no hotels in Bambarra! Elizabeth and Ernest Forbes housed two of the three field schools we organized. Hon. Robert Hall, an officer in the government and son of Constance and Emmanuel Hall, visited the projects and gave the students history lessons about the Islands. The next step was to locate the plantations. After I explained that my purpose for being there was to locate the actual Loyalist plantations I had been studying, Constance Hall took me to the abandoned Ferguson plantation where she was born. A young teacher on the island, Valerie Hamilton, guided me to many other places. This kitchen on Hauler Plantation was well preserved. Mr. Alton Higgs guided us to the Haulover plantation near the settlement of Lorimers. I was immediately struck by the many similarities between Haulover and plantations of the same period in the U.S. Built by Loyalist Dr. John Lorimer some time around 1800, it had the spacious main house with obvious divisions of rooms including dining rooms, bedrooms and studies and was similar in many ways to the Hermitage, former U.S. President Andrew Jackson’s plantation near my home in Tennesse. Haulover’s separate kitchen was relatively well preserved, with a large fireplace and hooks to hang pots on. Having a separate kitchen from the main house was the common practice in America due to fire hazards. The builders of Haulover followed suite. Haulover had slave cabins built beside fields ready to be cultivated, as did the Hermitage. An overseer’s house was nearby at Haulover, ready to receive instructions from the master. There were other similarities as well. Both men had villages named for them: Old Hickory in Tennessee (Jackson’s sometimes nickname), and Lorimers on Middle Caicos. Dr. Lorimer’s gravesite lies nearby, just as Andrew Jackson’s grave is on the grounds at the Hermitage. With the help of Ernest Forbes, maps of plantation locations and detailed land and household appraisals, we correlated documented data with topography, landmarks and geographical features and identified more plantations. Ernest’s knowledge of the Islands and succinct observation—“Just follow the chimneys”—were invaluable. 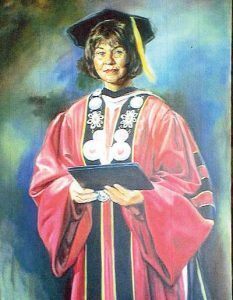 A portrait of Dr. Charlene Kozy, who was a teacher and dean at Cumberland University for 21 years. In retrospect, my quest to “rediscover” the Caicos Islands Loyalists led to much more than I originally expected. I satisfied my quest to correlate the microfilm descriptions with actual places and structures on Middle Caicos and completed my dissertation, “A History of the Georgia Loyalists and the Plantation Period in the Turks and Caicos Islands,” earning a doctorate degree that led to working at Cumberland University for 21 years, serving as president for the last three. For some of the students I brought down for the field schools it was their first trip outside the United States and their first experience living in a different socio-political environment. Such real-world learning experiences are not possible in a university setting. Just as important are the long-lasting friendships forged with archaeological colleagues working in the TCI such as Drs. William Keegan, Shaun Sullivan, Glen Friemuth, Lisabeth Carlson and Donald Keith. I have mourned the loss of friends in the Caicos Islands over the years, but I cherish the memories of time spent with them. I am eternally grateful to Dr. Fred Rolater for his support. To rephrase John Kennedy’s statement to the German people, “Ich bin ein Berliner”—“I am a Turks & Caicos Islander.” As one of their own, I salute the people of the Turks & Caicos Islands.